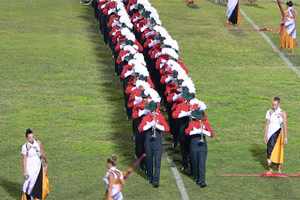 As the entire drum corps community looks ahead to the New Year and the summer of 2010, this week, Drum Corps International recaps some of the highlights of 2009, today with the most popular "DC-eye" fan-photo submissions. "DC-eye" is DCI.org's popular photo-of-the-day feature showcasing images submitted from the lenses of drum corps fans around the world. 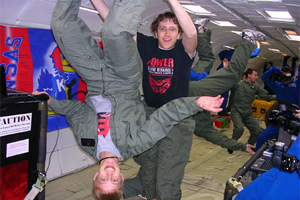 These five photos were the most popular among more than 244 posted DC-eye submissions in 2009. 1. 2009 Spring Break Photo Contest winners With the opportunity to win one of several prizes as part of the DC-eye Spring Break '09Photo Contest, fans of Marching Music's Major League showed their drum corps spirit during their spring vacations, snapping photos of themselves in exotic locales across the globe ... Read the story behind this photo. 2. 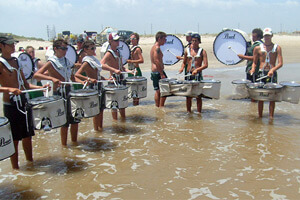 Beach bash This is Memphis Sound's 2009 rehearsal at the beach in Texas ... Read the story behind this photo. 3. Uncanny coincidence Three former Kiltie members discovered that they each have kids marching as members of the Phantom Regiment this year and all three are named "Nick." ... Read the story behind this photo. 4. SCV takes the field This photo was taken at the Southwest Corps Connection show on June 24, 2009. It was the first DCI show I have attended ... Read the story behind this photo. 5. Kudos Cadets, and thank you Cavaliers I took this photo in Denton, Texas on July 19. 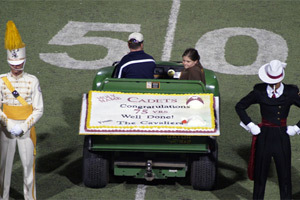 It was really cool to see the Cadets' anniversary show, but even cooler to see the huge cake the Cavaliers presented to them as a 75th anniversary gift following the competition ... Read the story behind this photo.